I like to call this the calm before the storm. The clouds before the rain. The “like” before almost all of my words. The last, oh… MONTH of my life and the lives of those around me. As I simultaneously lost my mind and remained relatively calm when I decided that no, I would not have an I-like-to-think-I-am-Kim-Kardashian-style birthday party because I am a normal person and not a participant on My Super Sweet Sixteen. Otherwise known as my last day in my twenties. I’m just gonna let that marinate for a bit and eat a lot of green stuff for 12 hours or so to make up for the copious amounts of sugar and booze I will be consuming for the next four (five?) days. I.can’t.wait. Preheat oven to 350 degrees F. Place kale in a large bowl and massage olive oil, apple cider, 1/8 teaspoon salt, nutmeg and pepper into for 1-2 minutes. Spread on a baking sheet in a single layer and roast for 10 minutes. Toss well and roast for 5-10 minutes more, until slightly crispy but not golden. While kale is roasting, heat a skillet over medium heat and add bacon. Cook until crispy and fat is rendered (about 2 minutes), then remove with a slotted spoon and let drain on a paper towel. Add the shallot, garlic, sweet potatoes and apples to the skillet, tossing with remaining salt and cinnamon. You want the sweet potato and apple finely diced, about the same size as the bacon bits and only slightly larger than the pom arils and pine nuts. Cook for 5-6 minutes, stirring occasionally, until soft. In a small saucepan, add pine nuts and toast over low heat for 5-6 minutes, until golden and fragrant. Set aside. 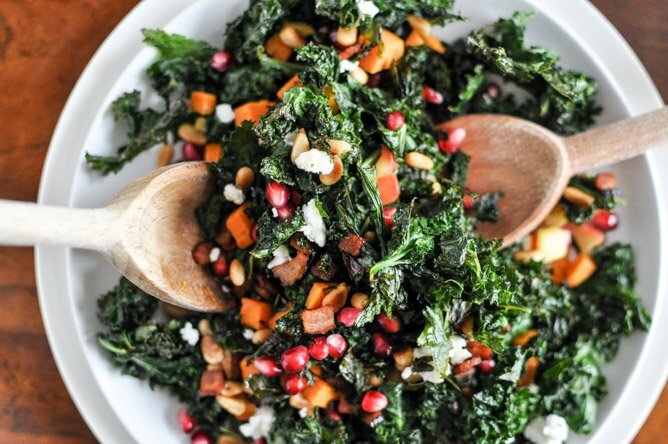 Combine kale with apples and sweet potatoes, pine nuts, goat cheese and pom arils. I don’t find this needs any sort of additional dressing (the kale will not stay crispy) but feel free to add some if you’d like. Oh wait… maybe I can. P.S. if I like this salad, you probably will too. I’m making this right now! And while the flavors and textures are fantastic, I really think you should add that the sweet potatoes will take forever to cook if you don’t bake or boil them beforehand. Thanks for the delicious recipe! I just had to leave a comment because I thought this was too coincidental! I saw your delicious kale salad pinned by someone on Pinterest and had to check out the ingredients. Hope the first few days of your 30’s have been wonderful! I made this today as a side for a brunch…it was a hit! Thank you for creating the perfect recipe to go with short rib hash! Would it be possible to make this with frozen kale? Um wow. I just made this tonight *almost* as written. I didn’t have sweet potatoes on hand so I used blue potatoes from the market. Made for some nice colors — I might even try blue AND sweet potatoes next time to get a rainbow salad next time. Anyways, this salad was probably the best I’ve ever had. Just saying. Try it, you will like it! I know it’s going to be staying in my (virtual) recipe box for a long time. I will keep you posted on what the crowd says. But what did i do wrong with the mushy kale and apple/butternut squash mix??? Seriously obsessed with this salad. I’ve made it so many times over the past 2 months, I just keep forgetting to comment. I love kale salad and have been eating a ton of it this week while I was doing a vegan juice cleanse. This looks delish! I would run into trouble right after toasting the kale, those chips tend to disappear quickly in my kitchen! 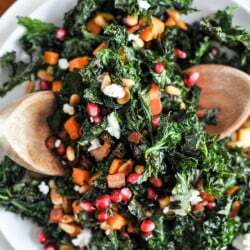 Looks delicious though, I will try to resist my kale loving urges and make this happen! Pingback: 10 Ways To Recover From A Food Coma - zdouf! By far the best salad ive ever eaten, thanks Jessica! Thanks for this amazing salmon recipe. I found your blog just now. This is a really well presented. I will make sure to bookmark it and come back to read more of your useful information. Thank you for taking the time to make this a quality offering to us. I, for on, will be implementing as many of these steps as possible. I desired to take some time to express my appreciation towards this wonderful website and you! Caring it! What’s Happening i am new to this, I stumbled upon this I have discovered It absolutely useful and it has aided me out loads. I’m hoping to give a contribution & help other users like its aided me. Good job! Well noted. All your points are very useful. Totally worth the read! A lot of things I’ve been doing already, but just never gave much thought to the greeting… probably because I don’t see a lot of others doing it. Good work there! Superb article. When I saw Jon’s email, I know the post will be good and I am surprised that you wrote it man! Absolutely good stuffs and keep it up! Can’t agree more and bookmarked this on Pocket as well!